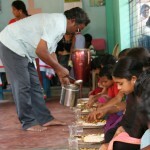 The Hope for India Project supports a children’s home of disabled, vulnerable & orphaned children. Workers have planted 7 churches of Hindu-converts to Christianity in and around Tenali city. Pray for these churches to continue to grow! About 90% of their evangelistic work is done throughout the Hindu and tribal peoples in rural and urban slum areas. If you have AIDS in India, you can not receive treatment in hospitals. So, workers run medical camps for people with HIV/AIDS to minister to the bodily needs of people suffering with HIV/AIDS and minister to their spiritual needs as well. Workers also have a ministry of visitation and provision for widows that have lost their spouses to AIDS. Widows also come to the children’s home to learn basic sewing skills as means of supporting their families and helping bolster their economic empowerment. You can sponsor a child in our program for $25 a month. To see the faces and read the stories of the children this program helps, please click here! Purchased computer equipment for Hope for India. All children in current child sponsorship program have been completely sponsored! 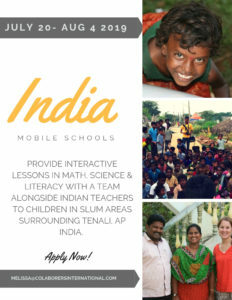 Launched open-air mobile schools in slum areas in India in July- This trip had American and Indian education volunteers providing interactive math, literacy and bible lessons to children in the slum areas surrounding Tenali, AP India. The education leader for the american elementary education students was Sarah Pinard who has her MA in education. The elementary education volunteers under her were Carly and Nicole. 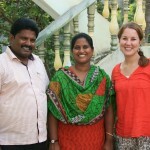 The education leader for the Indian volunteers was Karuna Annavarapu who has her BA in education. The volunteers under her were Raju, Kiran, Mariyamma and Moshey. Continued general financial support and child sponsorship and preparation for mobile slum school launch. Child Sponsorship Program launched. To sponsor a child, click here! Provided medicines for AIDS outreaches, children’s home grew. Purchased motorbike for leaders to travel between church plants & school fees for children helped through the children’s home. 1) Intern or Volunteer – click here! 3) Short Term Aide Trips – click here! 4) Church Partner – click here! 5) Sponsor a child – click here!